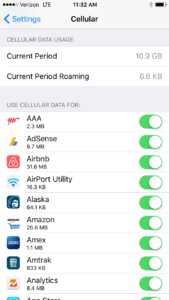 You’re scrolling through Settings -> Cellular to determine which apps are using the most data on your iPhone, and you run across something unexpected at the bottom of the list: The apps you’ve already uninstalled are still using your cellular data! How is that even possible? Fortunately, it isn’t – and they’re not. The Cellular section of Settings is designed to give you an accurate idea of how much data you’ve used since you last reset the statistics. If you’re burning through your data plan and you don’t know why, this list can be a lifesaver. Imagine this scenario: Last month, you went way over your cellular data limit. You found my article about what uses cellular data on iPhones and you’re scrolling through the list of apps in Settings -> Cellular. Two weeks ago, you uninstalled the Yelp app. That app had used 23.1 MB (megabytes) of data between the time you reset the statistics and the time you deleted the app. If the data the Yelp app used before you deleted it vanished from Settings -> Cellular when you deleted it, the total amount of cellular data your iPhone had used would be inaccurate. 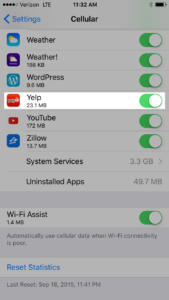 To keep the correct total, your iPhone added Yelp’s 23.1 MB of data to Uninstalled Apps. Uninstalled apps aren’t using data on your iPhone. “Uninstalled Apps” is the sum total amount of data that apps you’ve uninstalled from your iPhone have used since the last time you tapped Reset Statistics. Let’s take our theoretical scenario and put it to the test. We’ll look at Uninstalled Apps in Settings -> Cellular on my iPhone, uninstall the Yelp app, and see if the data the Yelp app had previously used gets added to to Uninstalled Apps. Before we uninstall it, the Yelp app has used 23.1 MB of cellular data, and the total amount of data apps I’ve previously uninstalled have used is 49.7 MB. I delete the Yelp app and head back to Settings -> Cellular. I notice two things right away: The Yelp app has disappeared, and Uninstalled Apps has increased to 74.6 MB. As I said above, we should be able to take the total amount of data the Yelp app has used (23.1 MB) and add it to the previous total of Uninstalled Apps (49.7 MB) and end up with the new total of Uninstalled Apps of 74.6 MB. But we don’t. When we uninstalled the Yelp app, we should have ended up with a total of 72.8 MB in Uninstalled Apps. The extra 1.8 MB means that the Yelp app was responsible for 1.8 MB data in the section called System Services, which it probably used while determining my location. Do Uninstalled Apps Use Memory On My iPhone? No. The list of apps you see in Settings -> Cellular only shows the amount of data each app has sent and received between your iPhone and your wireless carrier (AT&T, Verizon, etc.). 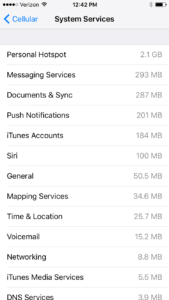 If you want to know which apps are using memory on your iPhone, go to Settings -> General -> Storage & iCloud Usage and tap Manage Storage under the Storage section. Now that you’ve learned that uninstalled apps is simply the total amount of data apps used before you uninstalled them, you can rest assured that your apps aren’t using data from beyond the grave. 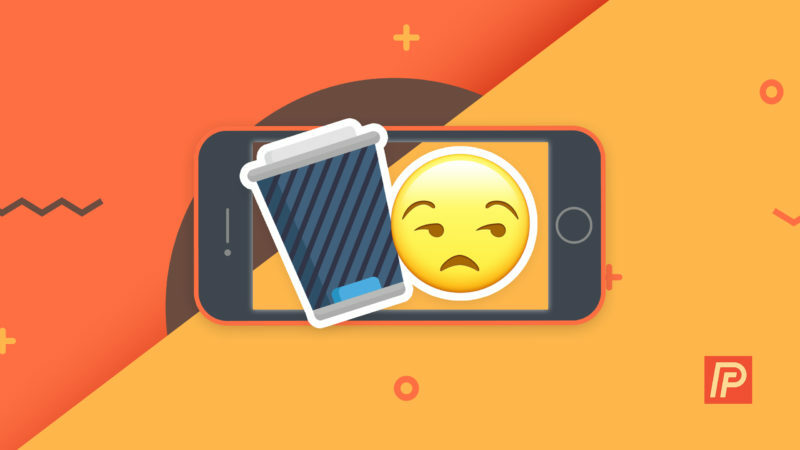 If you’re wondering about which apps really are using data on your iPhone, check out my article called What Uses Data On iPhone?. Previous ArticleHow Do I Delete All Photos From My iPhone? Here’s The Fix! Next Article Why Does Facebook Keep Crashing On My iPhone and iPad? The Fix!